Secular Meditation is a practical guide for people who want to learn meditation without any of the trappings of religion. 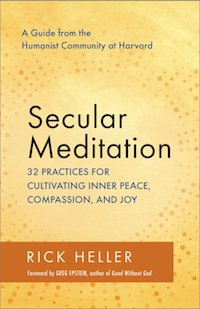 The author, Rick Heller, has been leading secular meditations at the Humanist Community at Harvard for more than five years. The goal of these meditations is to help find joy and relieve stress. A major emphasis is loving-kindness practice, which helps people experience love and joy in their personal lives, and has the potential of nurturing a more caring society. Part One presents practices that cultivate feelings of love and compassion. In addition to formal sitting meditations, it presents informal practices to help cultivate love toward people one encounters in daily life. Also included are personal stories from a variety of people and brief discussion of scientific research on meditation. Part Two presents meditations that bring inner peace. This section includes mindfulness of breath meditation, ambient sound meditation, the body scan meditation and other practices. These practices contribute to inner peace by calming the mind and reducing agitated thoughts. Part Three presents practices that can help a person cultivate joy. These include walking meditation, mindful hiking, mindful eating and contemplative photography. By raising awareness of the rich sensations around us, one can experience everyday life as delicious. Part Four presents additional practices such as awareness of emotions and envisioning practices. This section will also touch on larger issues such as whether the concept of “enlightenment” is meaningful in a secular context.